"We were just taking photos and hanging around talking, and then Trudeau, he just comes running," says one of the students in the picture. New Delhi: Canadian high school students in Vancouver were posing for pictures before their prom when Prime Minister Justin Trudeau jogged past them. At first, it seemed like they did not even recognise Mr Trudeau - in shorts, a t-shirt and running shoes and headphones in his ears. Can you spot him in this picture? 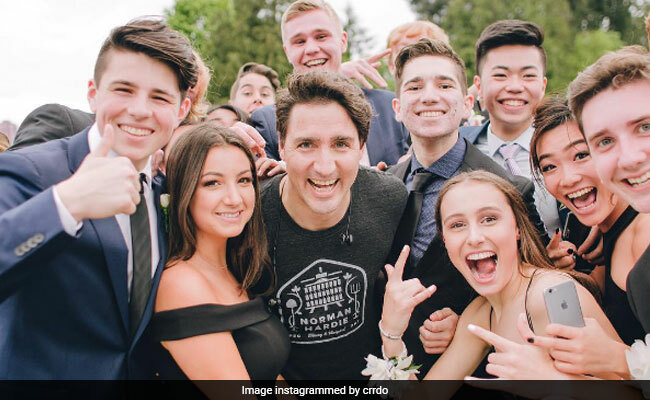 Mr Trudeau's official photographer, Adam Scotti, tweeted a picture of the moment on Friday, captioning it: "Prom season in #Vancouver." @AdamScotti Love this photo bomb! @AdamScotti Love Canada. PM can run through a crowd no crazy protective entourage necessary. "We were just taking photos and hanging around talking, and then Trudeau, he just comes running," one of the students in the picture, Constantine Maragos, tells CBC. "At first, we were like, 'Why is the prime minister of Canada running the seawall? And then we started yelling for Trudeau to get in the photo." Another student, Sofia Kalil, tells CTV that Mr Trudeau stopped to take another photo with the students, wished them a good evening and resumed his run. "This is part of a little side project to document the places we go and the runs we go on. Sometimes it's just scenic shots, other times, it's running past an unsuspecting grad group - half clued in, others were more distracted by the ginger with the camera," he writes. "A memorable moment for all. I always love to watch people's faces as they realise who just ran past, often several paces after he has passed."